So I was at Walgreen’s getting a card, and happened upon this display in the “impulse buy” area next to the check-out. I snapped this photo with my phone, uploading it to facebook while waiting to check-out, captioning it “You can’t make this stuff up.” I thought that would be it. 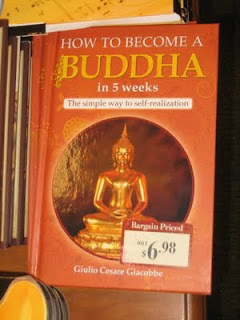 I thought it would speak for itself, like the photo of this book I uploaded a few months ago. Oh wait. I get it. Eight- to ten-year-olds are not generally super-thorough about brushing their teeth. They’re old enough to do it themselves, but not old enough yet to be fastidious about it in preparation for makeout sessions. They are probably the world’s worst toothbrushers. 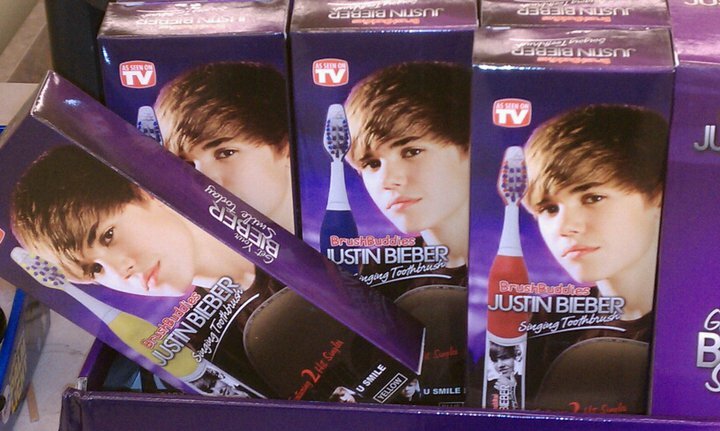 So if they know they have to brush their teeth for the length of the Bieber song, that’s kind of really genius. OMG, I just thought inside my head that a Justin Bieber singing toothbrush is genius. Someone please kill me. Wow, I’m so glad no one heard me think that. But Bieber? Really? I hope my kids have better music taste than that. Like, an Adele toothbrush, or Jeff Buckley, or maybe they’ll be retro throwbacks and will like The Ramones or James Brown. I would even take Katy Perry or Miley Cyrus over Justin Bieber. Adele. I love Adele. I kind of want an Adele singing toothbrush, because let’s be honest... moms of young kids are probably almost as bad as tweens in terms of doing a cursory, half-assed job of brushing their teeth. I mean, I brush them twice a day, but I’m often multi-tasking (if it’s morning) or dead on my feet and/or inebriated (if it’s evening). It would be nice to hear a little “Turning Tables” or “Someone Like You” and not be allowed to stop brushing until the song was done. It would be kind of zen. Like, I could focus on one thing. A lovely song, and cleaning my teeth. Well, OK, that’s two things. But still, it’s like five fewer things than I am usually focusing on. You know, I would probably get really sick of those songs if I heard them twice a day. I might grow to hate Adele. I don’t want to hate Adele. I guess I don’t want an Adele singing toothbrush after all. All of those Bieber fans. They're going to grow to hate Justin Bieber. Hey wait. That’s friggin’ awesome. It’s like a Justin Bieber deprogramming device.